It’s not about ending poverty; it’s about eradicating the poor. After recent reports of ongoing and systemic failures on resettlement, the World Bank approved an urban development project in India that would displace hundreds of people from their homes and livelihoods. Through their own interventions, residents have been successfully organizing and making sure the World Bank and local government authorities are respecting their rights. 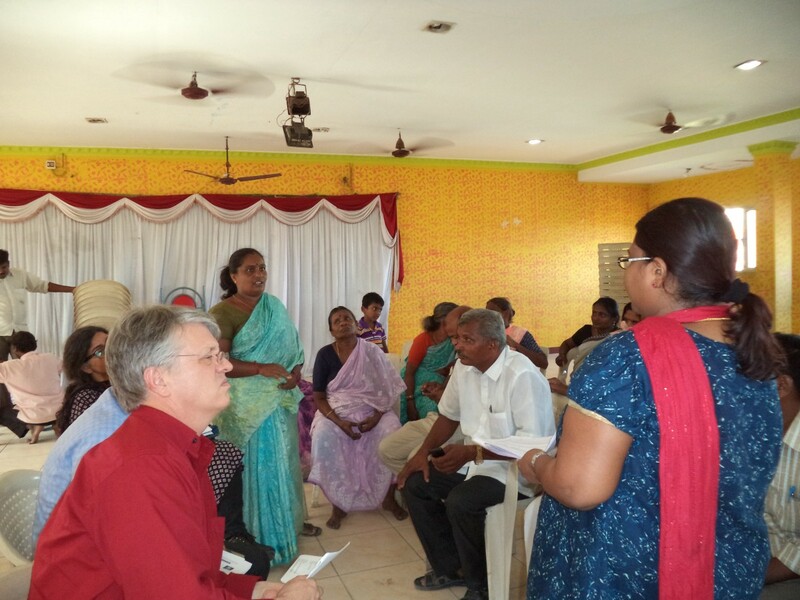 In late April, residents of Paadi Kuppam, a neighborhood in Chennai, India met with officials from the World Bank for the very first time. Families living in four areas of Paadi Kuppam are to be displaced in the coming months by a ‘sustainable urban development program’ funded primarily by the World Bank. In total, 330 families are expected to lose their homes and livelihoods. Until a few weeks ago, most people did not know they were going to be resettled. In fact, local officials had assured them that the project had been dropped. After learning that this was untrue, residents and volunteers have been organizing to demand that their concerns be heard and their rights respected. Credit: ICIJ and the Huffington Post. In India alone, over 388,000 people are estimated to have been physically or economically displaced by World Bank funded projects over a 10 year period. What’s happening right now in Chennai is especially remarkable considering recent reports that the World Bank has consistently failed to protect vulnerable communities from the worst impacts of the projects they fund. According to an external investigation over a 10-year period, projects financed by the Bank have physically or economically displaced at least 3.4 million people around the world, a majority of them in Asia and Africa. In India alone, 24 projects have likely displaced over 380,000 people. In far too many cases, there is little to no information about what happens to communities after they’ve been relocated. In one report, conducted by the International Accountability Project’s Global Advocacy Team, it was found that in four World Bank funded projects 71% of those displaced received no compensation for the losses they suffered. These numbers reveal a staggering disconnect between what governments and institutions claim they are doing in the name of development and what actually happens in practice. “It’s not about ending poverty; it’s about eradicating the poor.”- Vanessa Peter, Policy Researcher at the Information Resource Center for Deprived Urban Communities. Tamil Nadu is the most urbanized state in India, with an estimated 35 million people living in and around cities and other urban centers. The city of Chennai itself is home to 6.5 million people. The World Bank funded ‘Tamil Nadu Sustainable Urban Development Program’ promises to resolve water logging and flooding issues in the city and its suburbs by building new storm water drains and repairing existing canals. This construction work necessitates the resettlement of hundreds of residents, many of who have lived in the area for decades. The International Accountability Project, where I work, first became aware of this project a few weeks after documentation on resettlement and environmental impacts had been disclosed. One document, found through IAP’s Early Warning System, was the draft resettlement action plan which listed the names and addresses of all the people likely to lose their homes. Relying only on official documents, it was difficult to tell if communities knew the full scope of the project and their rights to influence or resist the plans that were being made. Not only had the local communities not seen these documents, they were hundreds of pages long, written in incredibly technical language and available only in English, not in Tamil, the predominant local language. In an effort to better understand what information residents had about this project, IAP reached out to Vanessa Peter, a policy researcher at the Information Resource Center for Deprived Urban Communities. Vanessa, together with Priti Narayan, an independent researcher, met with local residents and compiled and published a Citizen’s Response documenting the many problems with how this project was being implemented. With the support of the IAP, they sent this response to all 25 Executive Directors of the World Bank prior to a key decision date. Vanessa Peter (far right) at a meeting with residents of Paadi Kuppam. 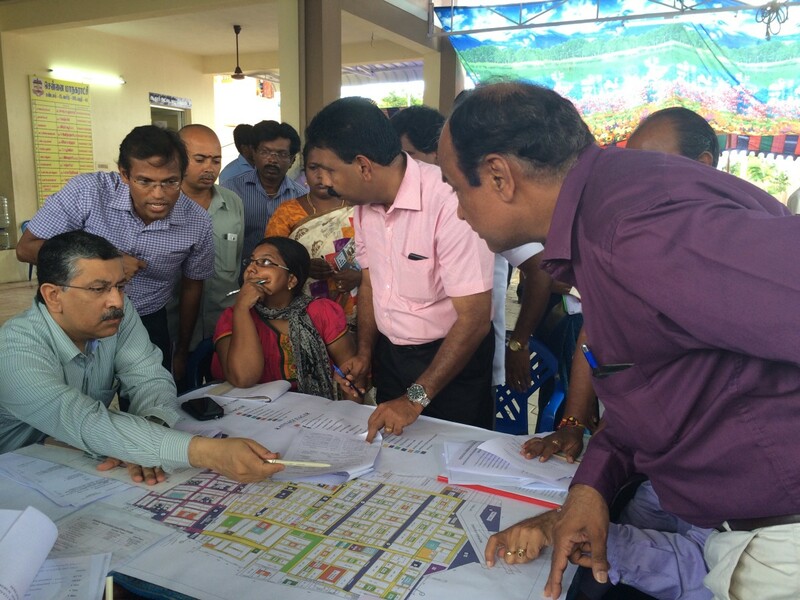 Vanessa, with support from IAP and the Accountability Counsel, has been spearheading efforts in Chennai to make sure local authorities are paying attention to residents’ concerns. Until the first week of May, residents did not have access to any of the documents in Tamil, the local language. Of the 330 families who will be resettled, over 82 are headed by women and 105 belong to scheduled castes and scheduled tribes. Almost all residents are engaged in some form of informal labor. Many women, for example, are employed as domestic workers in houses nearby, making their livelihoods contingent on where they live. Documents published by the World Bank suggest that a few consultations with residents did take place in late December and early January. Residents in some areas, Paadi Kuppam for instance, dispute that these consultations even occurred. The Bank’s reporting on each consultation is far from consistent. It is unclear, for example, why some complaints were addressed and others ignored. For instance, residents were successful in persuading the local government authority in charge of this project, the Corporation of Chennai, to reduce the number of affected families from 467 to 330. However, most other comments and suggestions were ignored. Residents were also unhappy with the two proposed resettlement sites, in the areas of Ezhil Nagar and Thirumazhisai, located 35 km and 16 km away from their current homes. Ezhil Nagar particularly concerned residents who were afraid they would not be able to access the same quality of services and facilities that they do now. It is routine that at this point for official documents to cease accounting for communities’ concerns and demands. Communities are rarely considered relevant to project plans beyond displacement and immediate environmental harm. In this case however, local volunteers and researchers were able to verify and challenge some of the Bank’s claims, ensuring that communities were fully updated on what was happening and how they may intervene. Since April, communities have successfully interrupted business as usual to make sure their concerns are being taken seriously. The have secured a host of promises from local authorities to improve access to information and the conditions at resettlement sites. 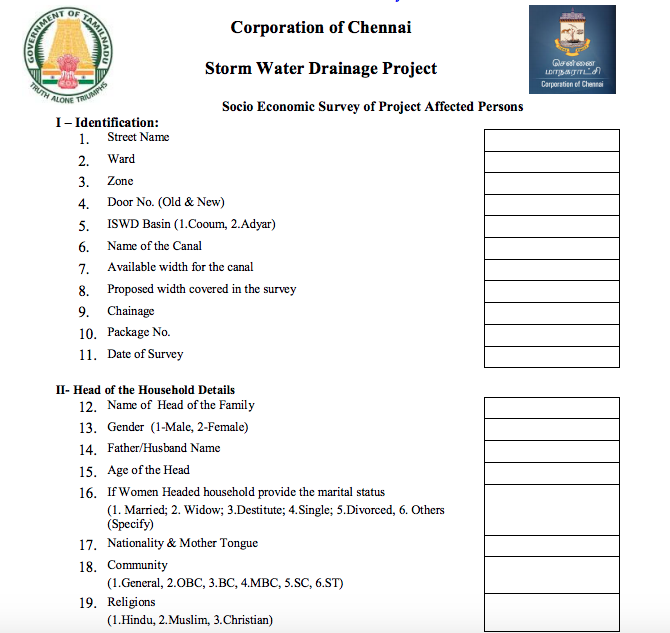 As a corrective step, the Corporation of Chennai, agreed to provide translated resettlement documents in Tamil to every resident who would be affected. They also recently held a public hearing for the first time about the various plans and proposals under this project. Some residents have already taken steps to identify solutions that would help them maintain their current homes and livelihoods. For example, residents identified one stretch of unused land owned by the state housing authority that is located very close to their present residences and would make for a much better resettlement alternative. By speaking out to funders like the World Bank, communities have also been able to resist and reframe the official narrative that this project is an overall public good and that resettlement has been planned with sufficient notice given to the communities. During their first public meeting with World Bank officials, residents of Paadi Kuppam disputed much of what project documents have claimed so far. They said that they had never been consulted. They only found out that they would lose their homes after Vanessa and her team had printed and shared the resettlement plans. They also revealed that much of the information the World Bank had collected had been secured using false pretenses. Residents were misinformed about why they were being asked to provide personal information. They thought they would be receiving an Aardhar card, a type of public identification card. They were not told that they were being surveyed for resettlement. Given these revelations, it is clear that communities need to be invited to be a part of preparing and drafting these plans, if only to make sure the information presented is factually correct. This World Bank project was initially monitored and analyzed as part of the Early Warning System, a joint initiative by the International Accountability Project and the Center for International Environmental Law. The Early Warning System ensures local communities, and the organizations that support them, have verified information about projects likely to cause human rights abuses and clear strategies for advocacy. Read more about this initiative here. International Accountability Project works to defend the rights, land and livelihoods of people threatened by destructive development projects.